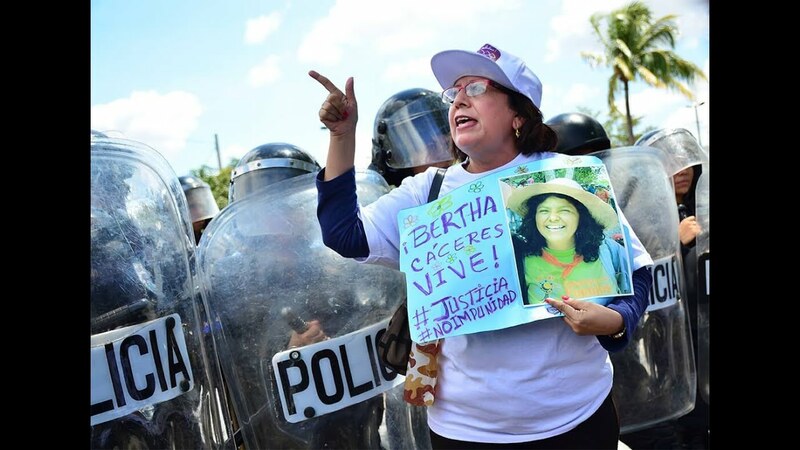 An activist’s murder highlights that the United States needs a new policy approach in Honduras since the current militarized strategy is merely exacerbating violence. On March 3, 2016, Honduran indigenous rights advocate and environmental activist Berta Cáceres was assassinated. The details of who was behind her murder remain unknown, but a fellow activist and friend of Berta adamantly claims, “[t]he government of Juan Orlando Hernández is responsible.” Cáceres had previously received numerous threats for her opposition towards the Agua Zarca Dam. Since her death, Honduran protests have erupted demanding justice and U.S. advocates have rallied to oppose the U.S. Agency for International Development’s (USAID) continued support of the Agua Zarca Dam. Cáceres’ daughter has spoken out against U.S. military aid to Honduras, which she argues fuels repression and violence. While Cáceres’ death has reinvigorated debate over U.S. policy in Honduras, the controversy is not new. U.S. security assistance to Honduras is meant to address rampant crime and insecurity plaguing the country, but instead it appears to be making a bad situation worse. In devising a strategy to address instability in the region, the United States has repeatedly referred to its past “success” in combating violence and drug trafficking in Colombia. There certainly are Colombian policies that may be worth trying to replicate in Honduras, like using innovative urban planning to reduce marginalization and violence. However, these constructive initiatives are not the policies that the United States is pursuing. To end the violence in Honduras the United States must change its policy. U.S. policymakers should refocus on funding community-based violence prevention programs and supporting serious anti-corruption initiatives. To date, militarized approaches to ending violence have led to persistent allegations of human rights abuses in Honduras. The roles of the Honduran army and its law enforcement agencies have been blurred over time, which has contributed to such violations. As InSight Crime’s David Gagne explains, “soldiers are trained for combat and to kill adversaries, not settle disputes or investigate crimes.” Militarization of law enforcement destroys trust and community support for police, both of which are key components to successful efforts to combat crime. In fact, research suggests that the militarized responses to crime have exacerbated insecurity and strengthened gangs in Honduras. Moreover, there are examples of inexcusable collateral damage: a joint U.S.-Honduran drug raid in the remote La Moskitia region in 2012 resulted in the deaths of two children and two pregnant women, and wounded numerous other innocent villagers when the officers mistook their passenger boat for one filled with narcotics traffickers. Additionally, there have been pitfalls in monitoring the distribution and use of weapons that are introduced into the country by U.S. security aid. A 2008 cable released by WikiLeaks shows that U.S.-supplied weapons to Honduras are now in the possession of the Zetas drug cartel. This discovery is not surprising after considering the staggering levels of corruption in Honduras. In 2011, the Vice President of the Honduran Congress cited a report that up to 40% of police were involved in organized crime. Corruption at the highest levels of Honduran institutions has previously foiled U.S. missions in the country. Even American trained and monitored Honduran special operators have been accused of pocketing a $1.3 million share of illegal proceeds seized during an operation. Given the high levels of corruption found across Honduran institutions, U.S. military and law enforcement assistance has not achieved the stated goal of diminishing violence. While homicides are down slightly from previous years, there is controversy over the validity of recent crime statistics. Further, part of the reported decrease in homicide rates may have more to do with professionalization of gangs as opposed to actual improvements in citizen security. Despite all of this, the U.S. Congress has increased military assistance to the region for 2016. Arguing that U.S. military assistance has not been effective, however, does not imply that the United States should resign itself to playing a passive role in combating violence in Honduras. Given the role that the U.S. policy of criminal deportations played in creating the transnational gang crisis that is behind a significant portion of the violence in the country, the United States has an obligation to assist in ameliorating the situation. Moreover, unless the United States wants the unaccompanied minors crisis to continue, investing in programs to support at-risk youth and to reduce violence in Honduras is in U.S. national interests. Therefore, it is time for a fundamental shift in U.S. policy toward Honduras. First, the United States should reevaluate the allocation of aid dollars going to Honduras. Instead of prioritizing interdiction of narcotics and arming corrupt military and law enforcement, the United States should focus aid on what has been successful. For instance, many of the existing violence prevention programs under the Central American Regional Security Initiative are worthy of expansion. The Latin American Public Opinion Project conducted a multi-year evaluation of the USAID community-based programs and found that treatment communities saw “43% fewer reported occurrences of murders than would be expected without treatment.” These USAID initiatives have not only been effective at violence reduction; they also do not lead to high levels of collateral damage like militarized alternatives. Second, the United States should fund efforts to address structural causes of violence that contribute to ongoing gang recruitment, such as marginalization, poverty traps, and inequality. Here is where Colombia should act as a model. In the 1990s, Medellin was the world’s most violent city, with a homicide rate significantly higher than that of any cities in Honduras. Today, while problems persist, the homicide rate decreased from 381 per 100,000 in the mid-1990s to 20 per 100,000 in 2015. Comuna-13, historically one of Medellin’s most marginalized and violent neighborhoods, now has tourists flocking to it to see the innovative urban planning initiatives that have helped fuel the “Medellin Miracle.” Adopting a Medellin-inspired approach to reducing urban spatial segregation in Honduran urban centers and offering secure forms of intercity transit would be highly beneficial towards improving the security situation. Third, as others have advocated, the United States needs to push for genuine anti-corruption efforts in Honduras. The United Nations-supported International Commission against Impunity (CICIG) in Guatemala is another example worthy of replication. While the CICIG has undoubtedly had its own share of problems, it helped expose the immense corruption scheme, known as La Línea, that resulted in the resignation and arrest of former President Otto Pérez Molina. CICIG has also led cases against major criminal organizations that were previously considered to be “untouchable”, gone after police involved in extrajudicial killings, and taken on the largest state company. The CICIG is funded through voluntary contributions from the international community. Yet, the United States has consistently played a vital role in financing the CICIG, funding nearly half of the Commission’s annual budget. In response to a wave of protests in 2015, Honduras did convene the Support Mission Against Corruption and Impunity in Honduras, however, most agree that this current effort to replicate the CICIG in the country is a mere "charade.” The United States should use its leverage to advocate and offer financial support for a true anti-corruption commission in Honduras. Observers have begun to draw parallels between the current U.S. policies in Honduras and U.S. policies in Latin America during the Cold War. It seems that once again the United States prefers to support regimes that are loyal to U.S. interests, regardless of their human rights records or the undemocratic means by which they come to power. If the United States is indeed weary of the rising anti-American sentiment among leftist governments in Latin America, arming and funding corrupt, right-wing regimes that are committing atrocious human rights violations is a very poor strategy. Approaches like the Obama administration’s recent efforts to normalize relations with Cuba are a much better way to combat lingering resentment to U.S. hegemony in the region. Similarly, if the goal of U.S. aid to Honduras really is violence reduction, the United States needs to change its approach. Improving citizen security will require expansion of local violence prevention programs, demilitarization of law enforcement, and rigorous anti-corruption efforts. Laura Blume is a PhD candidate in the Department of Political Science at Boston University. She graduated from Simmons College in 2013 with a BA in Political Science and Public Policy. Her research focuses on citizen security issues in Central America and Mexico. Photo is licensed under CC-BY-2.5.